I wanted to give you a glimpse into my personal life for just a moment. Not that I’m that private of a person anyway, right? I know, it’s that midwestern, straight from the shoulder mentality. Be it as it may. Anyway, because of the Lupus, or perhaps something else, I have developed a type of inflammatory arthritis so my doctors have decided to fuse my right wrist. The hope is that we can do this naturally, without surgery or metal, meaning I have to wear a hard cast brace when I sleep and as much as I can in the daytime. 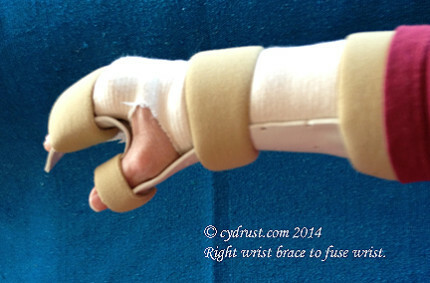 My wrist has become so painful it is difficult to do much of anything without wearing a brace. I can barely hold a paintbrush, and painting with one has become unbearable most days. Even the palette knives are difficult to grip. Ironic isn’t it? I spent the last year trying to remember how to hold the brushes after losing my memory…and now that I remember how, I physically can’t. Go Figure! So…where does that leave me? And then it hit me…Finger Paint!! No brushes or palette knives to hold. Nothing to clean. This is huge, I thought. I can do this! So I ran out to the studio, grabbed a canvas panel and some acrylic paints that just happened to be laying out, and without any thought at all, squirted paint onto the side of the panel and started dipping my fingers in. It worked! And it felt good, kind of squishy like when I used to work with clay. And guess what? No pain! And so I have begun.. The best part is, no brushes, means no clean up or chemicals, and that means I will be switching to oils! I am so excited I don’t even know how to tell you my friends. Between the use of oils, and the finger painting itself, my art is about to undergo the greatest evolution thus far. And I eagerly embrace it! I feel alive again. Like I am on the correct path. Finally. I will be changing my blog posts to about once a week . If you to want to follow along and try finger painting, I will attempt to write in a way that you can learn right along with me. I promise to share the good, the bad, and yes, the ugly. 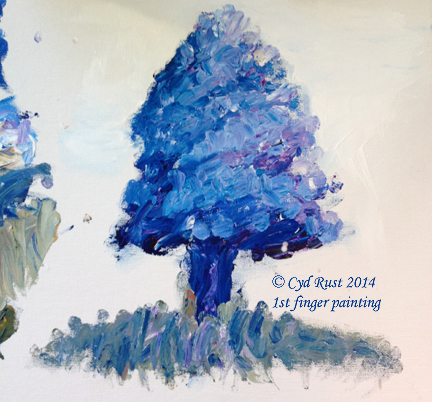 I hope you will stay with me on this journey to “Experience the Art of Finger Painting”. Cyd, I love how you face adversity head on and keep going, evolving and growing. I admire that so much. Great tree! I can’t wait to see more of your finger paintings! hi cyd! excuse the bad typing, but using my left hand only. I’m in your bloom true course and i saw your comment and followed your advice. you are so brave! and i can’t wait to see how you work around this! thanks for the inspiration and i will def use my lefthand and then just my right fingers when able. should be ready to rock and roll by monday! Copyright ©2019 Cyd Rust/Rust Studios. All Rights Reserved.